I’m not sure if it’s too late to say Happy New Year but it’s my first post of the year so I’ll say it anyway: Happy New Year & Welcome back to the blog! Today’s post will be part of the Mapacha Series and if you’ve been following me for a while, then you’re probably well acquainted with it and many of you love it so why not get the year started with one? We both wore monochromatic outfits with a twist, as always, to suit our personal styles. 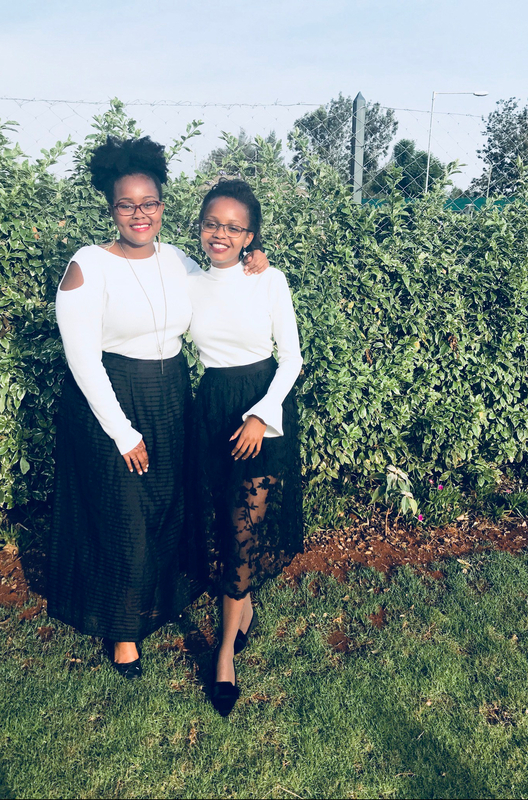 For those who follow me on Instagram, then you’re aware of our #SundaySisterSlay series where we dress in color co-ordinated outfits on Sundays. Sharon went with a cold shoulder ribbed long sleeve and a black stripped maxi skirt while I went with a white long sleeved turtle neck with bell sleeved paired with a flowered black mesh midi skirt. Sharon chose to accessorize with a few gold accents- the dangling earrings, long chain and gold bow on her shoes while I chose to keep it simple with pearl earrings and a purple lip. I’ve definitely been into monochrome outfits lately as obvious from the last fashion posts: SCOOT and THE PLACES. You could however choose to break the monochrome with another color, which we mostly prefer to be red/ maroon as seen in the last post from this series (linked above). In other news, I hope your year is off to a good start and you’re doing better this year in setting realistic goals/ resolutions that you plan to keep yourself/ get someone to keep you accountable on. My focus this year is to be really present, to really live and do- boldly. I’ll leave you with two quotes that will be part of the mantras I’ll be using to remind me of what I want for my year and for myself- which I’ll continue to discuss on here as the year progresses. “I have promised myself this; that I shall not be afraid of defeat. I shall not love with doubt or laugh halfheartedly. I shall pray to God till my knees burn, embrace my complexities and smile at the stars more on colder nights. I shall grieve when I’m hurt and ask questions when I’m not sure. I shall dance to music that moves me wherever it gets me. I shall make love with life. I promise myself to do whatever I have to do, as long as I do not live dying. When death gets here, it should find me spent. “I shall not be afraid of defeat”- my new mantra potentially 😊.